On Living in Fear. Or Not. Last week, I made the last of my confirmation visits to our seventh grade students, the ones entering our two-year confirmation process. Most of the visit is about just getting to know the students, what they are interested in, what school is like for them, what they did over the summer. When I asked about school and about how the year had started for him, the student I was visiting stopped me and suddenly became much more animated. He began to recount what had happened that very day. He told about a drill they had to go through to help prepare them for what might happen if a shooter came into their school. They were told over the intercom that the school was on lockdown and that they should initiate the protocol for an emergency involving an armed intruder to the school. During the first week of school, they had been told what to do; they knew the drill, literally. So, the entire class of students huddled in a corner of the room away from the door and windows and the teacher locked the classroom door. They didn’t know whether or not it was a drill. They didn’t know that it wasn’t, and the student said they thought it probably was, but they weren’t told whether it was or not. He talked about the wave of fear that overcame the huddled group of students when someone came to their classroom door, unlocked it and stepped in. It was someone the student hadn’t seen before, and his first thought was that this was real and someone had just entered their classroom to harm them. This all happened last Thursday, ironically, the same day that the mass shooting happened at Umpqua Community College in Roseburg, Oregon. Of course, the students didn’t know any of that, and I suppose it doesn’t matter. Only one of those strange, haunting coincidences. As I sat there listening to this seventh grade student — a bright, well-adjusted, very gifted and articulate student who is growing up in a stable family with two parents who love him and provide for him — my heart sank. I get the idea of safety drills. No one ever knows what is going to happen and practicing what to do if the bad stuff happens makes some sense. I grew up on the plains of western Nebraska, an area where tornadoes were not uncommon; we went through tornado drills and fire drills. We always knew when they were drills and when they weren’t. 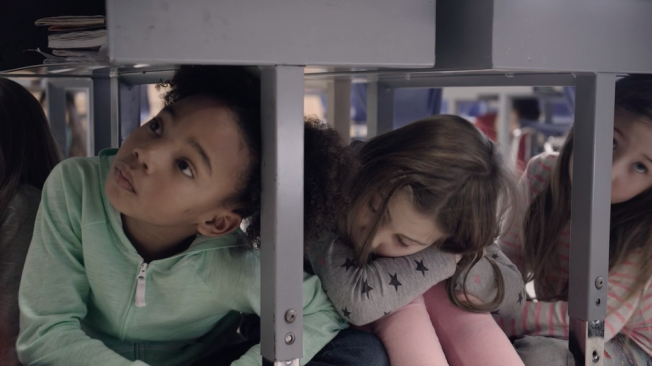 We’d do our thing of getting out of the school for a fire drill, or getting down under our desks for the tornado drill, and then it would be over and we’d get back to our business. But I never worried about someone coming into my school intent on shooting us. Now, our children worry about that. And in the case of the drill fail at a local middle school last Thursday, we had a group of students who for a split second thought that their nightmares were coming true. I think it’s bad enough that so many lives are ending too quickly and too violently because of gun violence in this country. I think it’s horrifying that we witness so many mass shootings. But think about this. Aside from the massive, senseless loss of life, we are raising a generation of children who are learning to be afraid. We are teaching them to be afraid of someone coming into their school to shoot them, that we have to worry about terrorism every time we get on an airplane, and that people who look different are to be distrusted because they could be terrorists. The pervasive culture of fear, especially for our children, is among the most tragic consequences of all. For now, let me state the obvious, and something which requires a choice for each of us: we don’t have to live in fear. Parents, we don’t have to live in fear. Let your kids know we don’t have to live in fear. There is a big, beautiful, awe-inspiring world out there, full of wonder and mystery, full of abundance and beauty. The bogeyman under the bed wins if we let him. We can choose to embrace what is good and beautiful about life, about community, about the people around us, the ones we know and the ones we don’t. We can live with curiosity and gratitude. Joy is possible. We can live hopefully, knowing that together we can curb the impulses to fear and the violence and hatred that engenders it. Choosing to see the good and dwell on it is the antidote to living in fear. I get my 35 middle school students for 90 minutes a week, and I’m determined that this is going to be a drumbeat with them. While there are scary things out there — there always have been — we don’t have to live in fear. I’m not about to let the madness draw my attention away from that. This entry was posted in life in the world and tagged children, fear, hope, joy, lockdown drill, parenting on October 7, 2015 by Jim Honig. This isn’t the first thing relating to a culture of fear. Every time it snows and we cancel school because someone could sue the school, we are teaching our children to fear. Every time it rains or snows and we tell them they have to stay inside instead of going out for recess because it’s safer, we are teaching them fear. Every time we tell them they can’t read this or that, or talk about a certain subject because it might offend someone, we are teaching them fear. We are always teaching children something, the question is what we are teaching them. Unfortunately, it seems that our society is obsessed with teaching fear and valuing a false sense of security. Keep up the good work of teaching them that their is another option, that fear is optional. That being a Christian doesn’t mean letting fear control who we are. I pray for you. Amen, Brother! We are a culture steeped in fear. And now in the thick of a presidential campaign season, we see it coming from the most visible (I hesitate to say “important”) leaders. Thanks, once again, for your thoughtful comments. One more thing: Fear and fearfulness are probably addictive . . . .What destroys/diminishes fear? Love, exhibited in loving words and touch! Could congregations exist as fear-reducing ministries?